DRPU KeyLogger software is easy to use convenient utility for recording all keystroke sequence while working with MS word, games, multimedia applications etc. Keystroke recording utility secretly investigates everything happens on your PC like keystroke recording, chat logging, Internet activity traces and more. Keylogger facilitates user by saving recorded data in a password protected encrypted log file with option to automatically send at your specified e-mail address so that you can easily monitor user PC activities even when you are far away. Windows keylogger is password protected restricting unauthorized user to access software settings or modify the log files. The GUI technology makes the software highly interactive and easily operable by the user in easiest way. How to monitor Computer using monitoring software ? Key logging program captures screenshots, records system startup time, any changes made in system date/time, sound clips and various other system and internet activities. Voice chat recorder provides option to run the software in hidden mode and does not appear in Add/Remove programs, Start Menu, Installation files and no shortcut icons on Desktop. Software offers Hot keys or Run Command settings to access advance keylogger utility when running in stealth mode. Stealth keylogger easily monitors keyboard typed activities including username, password, website URLs etc. Invisible monitoring utility track all user data, files, folders with name, date, time and location. Surveillance tool facilitates to run in hidden mode and is undetectable in Add/Remove Program list, System Startup, Shortcut icons on Desktop and Program folders. Saves all chats history, E-mail addresses, visited website URL details in hidden password protected log files. Facilitates to set Hot keys or Run command option so as to access keylogger software when running in stealth mode. 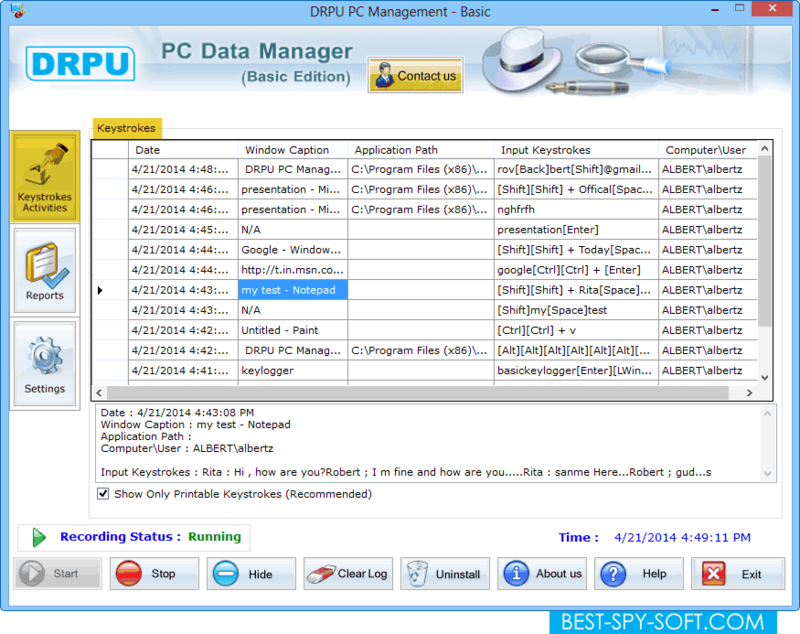 Key logger utility with graphical user interface (GUI) helps users to easily operate the software. Parental monitoring tool can be easily understandable by the user itself without requiring any prior technical help.